We haven't written much about China's JAC Motors, primarily because the company hasn't taken us on any surreal test drives, made a phallic car or given us a giant tea set. 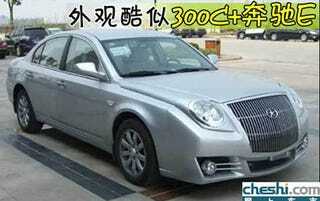 But these photos from China Car Times show a new Chinese sedan that's part Ford Taurus, part Chrysler 300C and partMercedes E-Class. Topped off with a Norelco electric-shaver grille just for kicks. The new JAC certainly caught our attention and makes this guy look like a total poser.